We're sorry. This credit card promotion no longer exists. 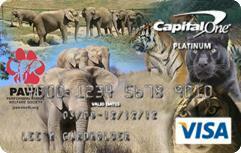 Capital One has terminated the program. Pat Derby talks about captive wildlife news at PAWS. Copyright PAWS. All rights reserved. Copyright for photos belongs solely to the Performing Animal Welfare Society. Images may not be copied, downloaded, or used in any way without the expressed, written permission of PAWS.